"Look behind the wealth of nations you will find information, look behind the poverty of nations you will find lack of information"
In the business world generally and ofcourse the ICT inclusive, the pattern of information flow any enterprise adopts define who they are and subsequently their level of productivity. It doesn't matter if you are a programmer, web designer or what ever discipline outside the communication parlance. What really matters is your ability to apply some managerial skills to be able to make an ICT startup work. Management involves the coordinated effort of human and material efforts in order to accomplish organisational goals. Therefore, being a genius in programming does not automatically make you a great manager. You need to learn some communication tools. 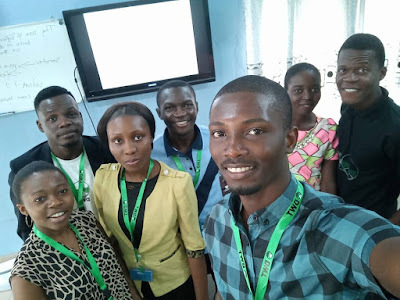 Speaking on Effective communication tools in an ICT startup, Miss Ima-abasi and ofcourse in agreement with other scholars made it clear that creating a conducive and healthy communication atmosphere motivates customer relations management, among others. Technology obviously didn't burn the bridges of communication entirely. So while we use the tech means of communication we should also pay attention to other traditional means of meaning sharing.